A look at the Spanish Emporion Coin 450-425 BC. 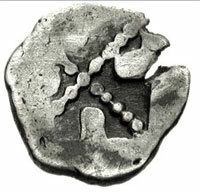 The Spanish Emporion coins are found with a great variation in weight, ranging from 0.65 to 0.05 grams. The majority fall below 0.30 grams, with only a handful at heavier weights. There are too few known, however, to clearly establish whether there were different denominations, or whether there was a long reduction in weight of one denomination. None of the references distinguish coins of differing weights, but merely identify these by type. Spanish Emporion Circa 450-425 BC. AR Hemiobol 0.48 g.
Incuse square, divided diagonally by dotted lines. Each side with square relief projecting inward. 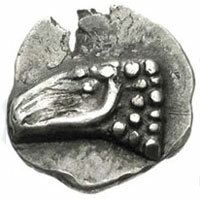 Auction Estimates for the Spanish Emporion (450-425 BC) in late 2009: £180 to £250 (GBP). Empuries (Catalan name; Ampurias) is a town on the Mediterranean coast of the Catalan comarca of Alt Empord. It was founded in 575 BC by Greek colonists from Phocaea and the name means (Emporion "market"). Emporion was later occupied by the Romans, but in the Early Middle Ages its exposed coastal position left it open to marauders, and the town was abandoned. After the conquest of Hispania by the Romans, Empuries remained an independent city-state. However, in the civil war between Pompey and Julius Caesar, it opted for Pompey, and after his defeat it was stripped of its autonomy. A colony of Roman veterans named Emporiae, was established near Indika to control the region. From that time onwards Empuries began to decline, obscured by the power of Tarraco (Tarragona) and Barcino (Barcelona). At the end of the 3rd century it became one of the first cities in Spain to admit Christian evangelists. The Greek town was abandoned in that century too, while the Roman town survived as a mint and the largely ceremonial seat of a coastal county, Castell d’Empuries, until the Viking raids of the mid-9th century. Coinage began again under count Hugh II of Empuries (1078-1117).. The ruins are midway between the Costa Brava town of L’Escala and the tiny village of Sant Mart.